It’s blooming fabric! Oh the fun you can have making painted fabric flowers. 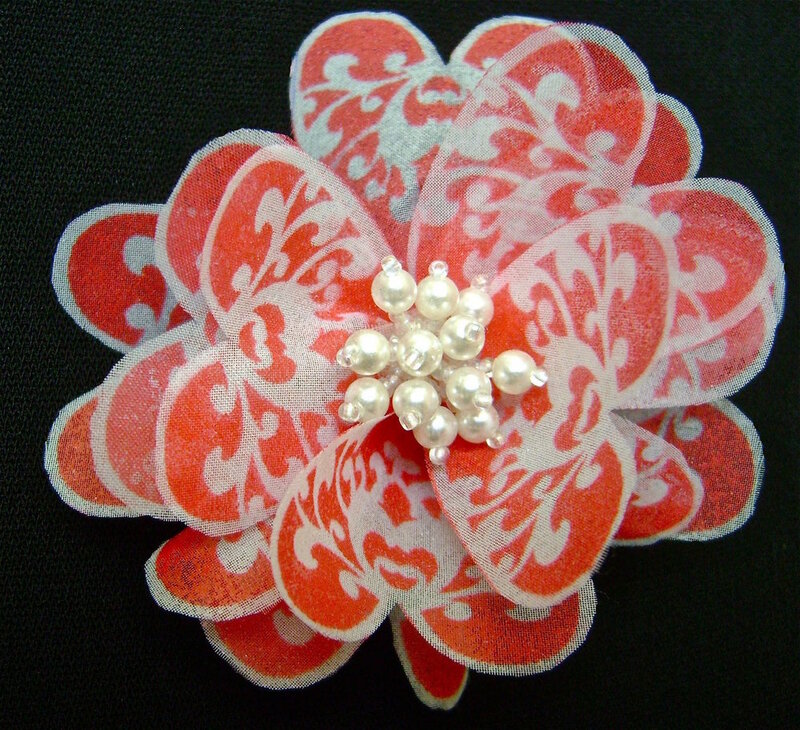 Pin them to hats, headbands, lapels, purses and anywhere you want a beautiful accessory. The peach flower and the Valentine Boutonniere are constructed in the same way. For complete Valentine flower details click the photo. The instructions below are for the delicate peach flower. I make nearly all my flowers with white organza fabric. Other soft sheer fabrics will work too. I like the effects you can achieve when spray painting on sheers. A good example is the red Valentine Boutonniere, one of my Divaonline Articles. step 1 -Print out the petal template page. step 2 - To make the fabric easy to work with, first iron it onto the shiny side of freezer paper which when bonded, turns the fabric from soft and flimsy into firm surface. step 3 - With a bristle brush, apply a coat of Fast Finish Decoupage to the bonded fabric. 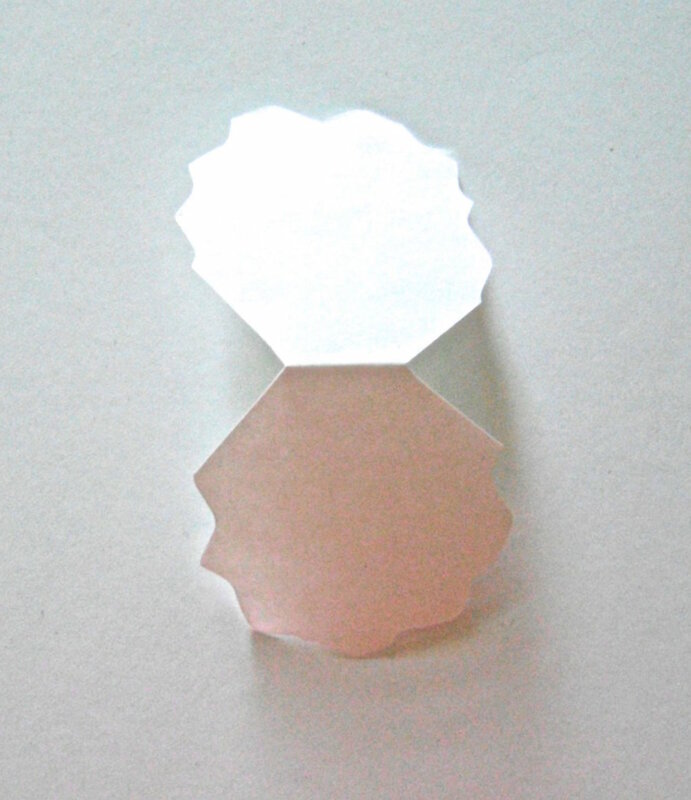 This product will give the finished flower petals the body they need. step 4 - Let the decoupage dry completely before cutting two strips each measuring: 4”x 2”, 3.5” x 2”, and 3” x 2”. step 5 - Using a rotary cutter with a wavy blade, cut all the strips into the shapes provided in the template. Do not discard the the petal border pieces. step 6 - Spray a fine mist of the orange paint on all the petals. step 7 - When the paint is dry, use the petal outline pieces to paint a border on each petal edge by holding the wavy shape about 1/2” from the fabric edge. Spray with medium coat of orange. Without moving the wavy shape, dust with a light coat of white. This will tone down the brassiness of the orange but leave a soft border on the petals. step 8 - I've used photos of the Valentine flower for these steps because they are clearer. Tie the center of each petal section with a string and a double knot. Leave the string tails about 3” long. step 9 - To assemble the flower, stack the petals with the largest on the bottom and the smallest on top. Stack each section in a different direction than the one below it. Each time you add another section, tie the string tails under the section below it. Knot the string and cut off the tails. step 10 - Turn the flower bottom side up and glue a small circle of felt or fleece over the knot with Fabri-Tac. Use Dazzle-Tac or other jewelry glue to attach a pin. step 11 - When dry, turn the flower over and glue an interesting button, pearl, or beads to the center. A button that is too large will force the petals to flatten.